The film begins with a flashback where two brothers Ravindra Varma (V. K. Sreeraman) and Mahendra Varma (Kalasala Babu) fighting for the royal family treasure along with their sons. During the fight, a prism from the idol of the goddess explodes. The brothers get frightened and immediately stop the fight. After conducting certain rituals, they find that the goddess is angry because of the bloodshed that happened and it is decided that the treasure will be locked for 41 years. 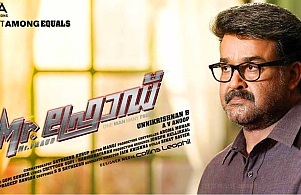 Present – a con man called Bhai Ji (Mohanlal) disguises as John Cliff and successfully loots 10cr from a wedding along with his assistants Abbas (Vijay Babu) and Priya (Manjari Phadnis). At that time, his acquaintance Javed introduces him to Nikhil Adharva aka Nikki(Dev Gill) who tells Bhai Ji about the royal treasure and the story behind it. He shows him the list of royal family members who are inheriting the treasure.